2Division of Hematology-Oncology, Beth Israel Deaconess Medical Center, Harvard Medical School, Boston, Massachusetts, USA. 3Jane Anne Nohl Division of Hematology, University of Southern California, Los Angeles, California, USA. 4Veterans Affairs Medical Center, Washington, DC, USA. 5Department of Biostatistics and Computational Biology, Dana-Farber Cancer Institute, Boston, Massachusetts, USA. 6Mount Auburn Hospital, Cambridge, Massachusetts, USA. 7White River Junction Veterans Affairs Medical Center, White River Junction, Vermont, USA. 8Veterans Affairs Connecticut Healthcare System, West Haven, Connecticut, USA. 9Division of Hematology Oncology, University of California Davis School of Medicine, VA Northern California Health Care System, Sacramento, California, USA. 10York Hospital, York, Maine, USA. Address correspondence to: Jeffrey Zwicker, Division of Thrombosis and Haemostasis, Division of Hematology and Oncology, Beth Israel Deaconess Medical Center, Harvard Medical School, Boston, Massachusetts 02215, USA. Phone: 617.667.9299; Email: jzwicker@bidmc.harvard.edu. BACKGROUND. Protein disulfide isomerase (PDI) is a thiol isomerase secreted by vascular cells that is required for thrombus formation. Quercetin flavonoids inhibit PDI activity and block platelet accumulation and fibrin generation at the site of a vascular injury in mouse models, but the clinical effect of targeting extracellular PDI in humans has not been studied. METHODS. We conducted a multicenter phase II trial of sequential dosing cohorts to evaluate the efficacy of targeting PDI with isoquercetin to reduce hypercoagulability in cancer patients at high risk for thrombosis. Patients received isoquercetin at 500 mg (cohort A, n = 28) or 1000 mg (cohort B, n = 29) daily for 56 days, with laboratory assays performed at baseline and the end of the study, along with bilateral lower extremity compression ultrasound. The primary efficacy endpoint was a reduction in D-dimer, and the primary clinical endpoint included pulmonary embolism or proximal deep vein thrombosis. RESULTS. The administration of 1000 mg isoquercetin decreased D-dimer plasma concentrations by a median of –21.9% (P = 0.0002). There were no primary VTE events or major hemorrhages observed in either cohort. Isoquercetin increased PDI inhibitory activity in plasma (37.0% in cohort A, n = 25, P < 0.001; 73.3% in cohort B, n = 22, P < 0.001, respectively). Corroborating the antithrombotic efficacy, we also observed a significant decrease in platelet-dependent thrombin generation (cohort A median decrease –31.1%, P = 0.007; cohort B median decrease –57.2%, P = 0.004) and circulating soluble P selectin at the 1000 mg isoquercetin dose (median decrease –57.9%, P < 0.0001). CONCLUSIONS. Isoquercetin targets extracellular PDI and improves markers of coagulation in advanced cancer patients. FUNDING. Quercegen Pharmaceuticals; National Heart, Lung, and Blood Institute (NHLBI; U54HL112302, R35HL135775, and T32HL007917); and NHLBI Consortium Linking Oncology and Thrombosis (U01HL143365). Protein disulfide isomerase (PDI) is a thiol isomerase that is primarily localized to the endoplasmic reticulum where it serves an essential role in disulfide bond formation during protein synthesis. However, PDI can also be released from cells in disease states or following tissue injury and contribute to pathological processes. PDI has been implicated in tumor progression (1, 2), neurodegenerative disease (3, 4), infectious disease (5, 6), and thromboembolism (7–10). In the context of thromboembolic disease, PDI is released from activated platelets and endothelial cells and is thought to modulate, through oxidation, reduction, or isomerization, a number of extracellular substrates, the best characterized being vitronectin (10–15). Targeting PDI activity with blocking antibodies or small molecules prevents both platelet accumulation and fibrin generation at the site of vascular injury in several distinct animal models of thrombosis (8, 10, 16–18). Inhibiting PDI activity may be useful in certain human diseases, but whether or not PDI represents a viable drug target has not been evaluated in humans. In order to identify potential therapeutic orally available inhibitors of PDI activity, we previously performed a high-throughput screen of bioactive small molecules. We identified a commonly consumed quercetin flavonoid as an inhibitor of PDI activity and subsequently found that an entire class of flavonoid quercetins inhibits PDI (16). Quercetin flavonoids are found in high abundance in various fruits and vegetables, and epidemiologic studies suggest that high-dietary intake of quercetins is associated with a decreased incidence of fatal ischemic strokes and myocardial infarction (19, 20). The administration of quercetin-3-rutinoside prevented thrombus formation in mouse models of thrombosis in a PDI-dependent manner (16). Structure-activity relationship assays revealed that quercetins with a glycoside at the third position of the C-ring inhibit PDI activity, including quercetin-3-glucoside (isoquercetin) (16). We observed that the administration of a single dose of isoquercetin to healthy adults resulted in a time- and dose-dependent decrease in plasma PDI activity and thrombin generation (13). These observations suggested that a commercially available quercetin flavonoid could represent a viable antithrombotic therapy. To assess the feasibility of targeting PDI in human disease, we evaluated the efficacy of isoquercetin to reduce hypercoagulability in cancer patients. Venous thromboembolism (VTE) is commonly observed in cancer patients, is a leading cause of morbidity, and is associated with increased mortality in this population (21, 22). In high-risk cancer cohorts, especially those in which protocol-driven radiographic monitoring for deep vein thrombosis (DVT) is implemented, the incidence of VTE within the initial few months of chemotherapy often exceeds 15% (23–25). Patients with advanced malignancies are also at an increased risk of bleeding (26). Notably, apixaban, a direct oral anticoagulant, was recently shown to be efficacious in reducing VTE in cancer patients but was also associated with a doubling in the rate of major hemorrhage (27). Developing antithrombotics that reduce the incidence of VTE without increasing the risk of major hemorrhage would broadly effect the care of patients with advanced malignancy. A total of 64 patients were consented for participation in the study. All patients who received at least 1 dose of isoquercetin were evaluated for the development of VTE, hemorrhage, and safety (Figure 1). There were a total of 28 evaluable patients in cohort A (500 mg isoquercetin daily) and 29 in cohort B (1000 mg isoquercetin daily). Table 1 shows baseline demographic data for the 2 dosing cohorts. The groups were similarly distributed for the pancreatic, non–small cell lung, and colorectal malignancies. Approximately half of the patients were enrolled at the start of the initial chemotherapeutic regimen and half at the start of second-line therapy. There were no statistical differences between the cohorts for baseline characteristics (Table 1). Flow diagram of patients according to isoquercetin treatment allocation. Measurement of D-dimer. The primary endpoint of the study was comparison of plasma D-dimer at baseline and at day 56. D-dimer is liberated from cross-linked fibrin following plasmin-mediated degradation and is the most validated and commonly utilized laboratory biomarker to predict hypercoagulability (28, 29). In patients with advanced cancer, plasma D-dimer levels are commonly elevated and correlate with an increased risk for developing of VTE (30, 31). As shown in Figure 2, in cohort A we observed a nonsignificant median change in D-dimer of +9.90% following the administration of 500 mg isoquercetin daily in the 25 paired samples available (paired t test, P = 0.92). In cohort B, D-dimer was reduced in the majority of individuals (18 of 22) with a significant median change of –21.9% (paired t test, P = 0.0002). Measurement of D-dimer following administration of isoquercetin. Waterfall plot showing baseline versus end-of-study comparisons of D-dimer values for each patient according to the dose of isoquercetin administered. (A) Median change in D-dimer was +9.9% (paired t test, P = 0.92) with 500 mg isoquercetin. (B) Median decrease in D-dimer was –21.9% with 1000 mg isoquercetin (P = 0.0002). Development of VTE. Patients were monitored for the development of VTE throughout the study, including end-of-study bilateral lower extremity ultrasound, to evaluate for asymptomatic DVT. In modified intention-to-treat analyses, there were no VTE that met criteria for the primary VTE endpoint in either cohort (Figure 3, A and B). There were 3 secondary VTE endpoints recorded in cohort A (2 incidental catheter-associated DVT diagnosed with restaging imaging and 1 lower extremity superficial venous clot). In cohort B, there were 2 secondary endpoint thrombotic events recorded (superficial venous clot of the lower extremity and incidental thrombosis observed in a lingular pulmonary vein on restaging imaging) (Figure 3, C and D). Cumulative incidence of venous thromboembolism. Venous thromboembolisms (VTE) were monitored clinically and by lower extremity ultrasound at completion of the 2-month study. Shown is the proportion of patients remaining free of VTE through the course of the study. There were no primary VTE in either the 500-mg isoquercetin cohort (A) or the 1000-mg isoquercetin cohort (B). The cumulative incidence of all secondary VTE endpoints (i.e., superficial thrombosis and distal thrombosis) shown in blue for both the 500-mg cohort (C) and the 1000-mg cohort (D). Assessment of PDI inhibition and thrombin generation in plasma. We previously observed that PDI inhibitory activity following the administration of a single dose of isoquercetin to healthy individuals could be monitored using a plasma-based assay that measures the dequenching of eosin moieties within a di-eosin-GSSG fluorescent probe (13). In both cohorts, the PDI inhibitory activity significantly decreased following 2 months of daily isoquercetin administration (Figure 4). The median change in PDI inhibitory activity for cohort A was +37.0% (P < 0.001) and cohort B was +73.3% (P < 0.001). Measurement of plasma PDI inhibitory activity following isoquercetin administration. Waterfall plot showing baseline versus end-of-study comparisons for each cancer patient. (A) Median change in PDI inhibitory activity was +37.0% (paired t test, P < 0.001) with 500 mg isoquercetin. (B) Median change in PDI inhibitory activity was +73.3% with 1000 mg isoquercetin (P < 0.001). The platelet-dependent thrombin generation assay measures thrombin generation following platelet activation and requires PDI (13, 32). As shown in Figure 5, the administration of isoquercetin resulted in a significant decrease in thrombin generation in both cohort A (median change –31.1%, P < 0.001) and cohort B (median change –57.2%, P = 0.004). There was significant correlation between increased plasma PDI inhibitory activity and decreased thrombin generation (Pearson correlation coefficient 0.45, P = 0.002). Measurement of platelet-dependent thrombin generation activity following isoquercetin administration. Waterfall plot showing baseline and follow-up platelet-dependent thrombin generation following isoquercetin administration. Change (%) for each patient shown in a waterfall plot for 500 mg isoquercetin (A) and 1000 mg isoquercetin (B). We did not observe an effect in standard coagulation assays following administration of isoquercetin. In cohort A, the mean prothrombin time (PT) at baseline was 14.0 seconds compared with 14.3 seconds at 2 months (P = 0.37), and the mean partial thromboplastin time (PTT) was 49.6 seconds at baseline and 45.6 seconds at study completion (P = 0.11). In cohort B, the mean PT at baseline was 15.1 seconds compared with 15.2 seconds at 2 months (P = 0.88), and the mean PTT was 54.2 seconds and 51.9 seconds, at respective time points (P = 0.37). Reduction in plasma soluble P selectin. P selectin is a transmembrane adhesion receptor that is externalized from α-granules in platelets and Weibel-Palade bodies in endothelial cells following cell activation. P selectin can be shed from the cell surface following externalization, and P selectin shedding is increased in cardiovascular disease, sepsis, and cancer. Increased levels of soluble P selectin have been shown to be predictive of VTE in cancer patients (31, 33, 34). We compared baseline with end-of-treatment plasma levels of soluble P selectin following treatment with isoquercetin. As shown in Figure 6, there was no change in soluble P selectin in cohort A (median change –0.3%, P = 0.26). In contrast, in cohort B soluble P selectin decreased in all patients except one, with a median change of –57.9% (P < 0.001). Five patients in each cohort concomitantly took low-dose aspirin, but the administration of low-dose aspirin did not influence the observed change in soluble P selectin in cohort A (P = 0.62) or cohort B (P = 0.81). Measurement of plasma P selectin levels following isoquercetin administration. Waterfall plot showing baseline and follow-up soluble P selectin values in plasma following isoquercetin administration. Change (%) for each patient shown in a waterfall plot for 500 mg isoquercetin (A) and 1000 mg isoquercetin (B). Description of observed toxicities. There were no major hemorrhages observed in either treatment cohort in modified intention-to-treat analyses. One patient in cohort A developed grade 1 epistaxis, and two patients in cohort B developed nonsevere gastrointestinal bleeding (grade 1 hemorrhoid and grade 2 rectal bleeding attributed to radiation proctitis). All reported toxicities considered as possibly related to isoquercetin by treating physicians are listed in Table 2. The most commonly reported toxicities on study were nausea and diarrhea, which are common toxicities of the concurrent chemotherapeutics administered. There were no severe adverse events (grade 3 or 4) that were attributed to the administration of isoquercetin. There were no deaths reported following the initiation of isoquercetin during the 2 months of follow-up. The results of this phase II clinical trial validate PDI as a viable therapeutic target for anticoagulant therapy. At 1000 mg daily, isoquercetin inhibited plasma PDI activity and significantly reduced plasma D-dimer levels along with soluble P selectin and platelet-dependent thrombin generation. In a cancer population considered at high risk for thrombosis and hemorrhage, we did not observe proximal DVT, pulmonary emboli (PE), or major hemorrhage. Elevations of plasma D-dimer are associated with an increased risk of thrombosis, especially in cancer populations (30, 35). Therapeutic anticoagulation with direct oral anticoagulants reduces D-dimer by approximately 20%, which is similar to the percentage decrease we observed at the 1000-mg dose of isoquercetin (36, 37). The lower dose of isoquercetin (500 mg) did not reduce D-dimer levels. The observed 37% reduction in PDI inhibitory activity at 500 mg daily may be below the threshold needed to affect plasma levels of D-dimer. The decision to proceed with a clinical trial at both dose levels was based on absence of longitudinal safety data with isoquercetin, especially in a patient population considered at increased risk for hemorrhage. This decision was also in part based on uncertainty regarding the cumulative effects of repeated dosing on PDI activity and the poorly understood mechanisms whereby PDI modulates thrombus formation, especially considering the dose of quercetin-3-rutinoside required to inhibit platelet aggregation in vitro is orders of magnitude higher than that needed to inhibit platelet accumulation in vivo (16). Despite not observing a reduction in D-dimer at the lower dose level of isoquercetin, we measured significant reductions in platelet-dependent thrombin generation and recorded no primary VTE endpoints. Although D-dimer is the most validated biomarker for venous thromboembolic disease, it is unlikely the most sensitive assay to assess therapeutic efficacy in a pathway that modulates both platelet reactivity and fibrin generation. A consistent reduction in D-dimer in an advanced cancer cohort is not anticipated without anticoagulation, which enabled us to implement a study design that utilized each study subject as their own control for the primary endpoint assessment. A possible confounder is patient dropout with respect to the paired plasma analyses. Dropout is unfortunately common in prophylaxis studies in cancer populations (i.e., nonchemotherapeutic studies) due to a multitude of factors, as evidenced by the AVERT study, in which nearly 40% of patients discontinued apixaban prior to reaching a study endpoint (27). To confirm that the observed reduction in D-dimer was not artifactual due to dropout, we performed sensitivity analyses for the 7 patients who did not complete the study, with the assumption that there was no change in these patients’ D-dimers compared with baseline. Even with this restrictive assumption, the decrease in D-dimer in the 1000 mg isoquercetin cohort remained highly statistically significant (P = 0.0004). This study was not designed to conclude whether isoquercetin reduces VTE; however, the absence of VTE is an intriguing observation. Similar to another phase II study we performed to evaluate the efficacy of low-molecular-weight heparin to prevent thrombosis in high-risk patients (23), we implemented an aggressive screening strategy in order to identify asymptomatic lower extremity proximal deep vein thrombi. We utilized the same inclusion and exclusion criteria as in the prior trial where we previously documented VTE in approximately 20% of those who did not receive pharmacologic thromboprophylaxis (23). In other cancer studies that implemented protocol-mandated imaging for VTE, 10%–20% of high-risk patients were diagnosed with VTE within months of initiating chemotherapy (25, 38). We utilized a prespecified VTE-independent adjudication committee that included a central radiology review of all radiographic studies indicative of a thrombotic event. Confirmation of a reduction in the incidence of proximal DVT or PE with isoquercetin will require the conduct of a large, placebo-controlled phase III clinical trial. At the doses evaluated in this study, isoquercetin administration reduced platelet-dependent thrombin generation but did not cause serious bleeding. Complete inhibition of PDI activity in plasma with blocking antibodies prolongs tail bleeding times in mice (8). Kim and colleagues observed that tail bleeding times were not prolonged in platelet-specific PDI-deficient mice, despite an overall decrease in the size of a thrombus following a laser-induced injury (17). We hypothesize that hemostatic-antithrombotic balance seen in our subjects is similar to that observed in animal models, whereby incomplete inhibition of extracellular PDI activity alters the propagation of a thrombus without significantly affecting hemostasis. Larger studies will be required to obtain a more rigorous understanding of the effect of isoquercetin on bleeding in patients with advanced cancer. Evidence suggests minimal drug-drug interactions, and quercetin carries a GRAS (Generally Recognized as Safe) status by the Food and Drug Administration. There are limited data regarding cytochrome interactions and isoquercetin, but, reassuringly, isoquercetin was well tolerated when administered in combination with chemotherapy. The data are largely reassuring regarding the interaction of quercetin and metabolism of drugs by cytochrome CYP3A4. The area under the curve of nifedipine was not altered when coadministered with quercetin, nor was the bioavailability of the saquinavir affected (both metabolized by CYP3A4). However, there is some evidence that cyclosporine levels can increase following quercetin administration (39). Pharmacokinetic profiles of drugs metabolized by other cytochromes (e.g., CYP2C9, CYP2C8), such as warfarin and rosiglitazone, do not appear to be influenced by quercetin coadministration (39). Quercetin does not affect P-gp–mediated efflux, as reflected by a lack of effect on digoxin pharmacokinetics (39). We observed that isoquercetin significantly lowers soluble P selectin levels and that this is an activity not shared by other anticoagulants, such as warfarin, dabigatran, or rivaroxaban (40–42). P selectin binds to P selectin glycoprotein ligand-1 on the surface of leukocytes to promote the generation of tissue factor bearing microparticles and thrombus formation (43). Soluble P selectin is formed by proteolytic cleavage of the ectodomain following leukocyte adhesion with activated platelets (44). Increased levels of soluble P selectin are predictive of VTE in cancer patients (33, 45, 46). In a prospective study of 687 cancer patients, soluble P selectin in the highest quartile was associated with a 2.6-fold greater risk of developing VTE compared with lower levels (34). In a mouse model of cancer-associated thrombosis, inhibition of P selectin completely abrogated thrombus accumulation following infusion of pancreatic cancer cell–derived microparticles (47). 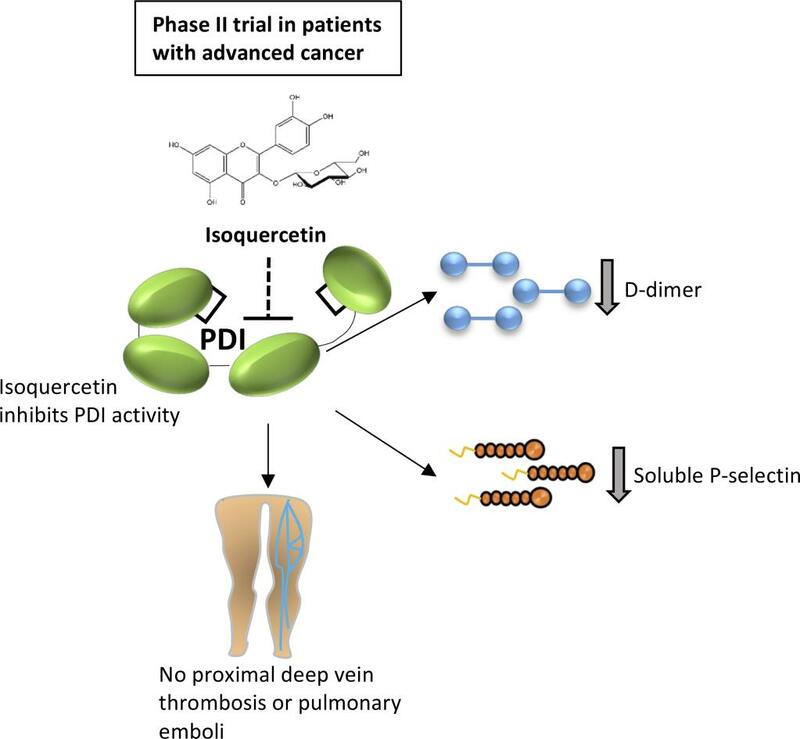 These data suggest that P selectin–mediated thrombosis plays a central role in the hypercoagulability of cancer and further support the clinical development of isoquercetin specifically for the indication of cancer-associated thrombosis. Sickle cell disease is another potential indication that merits investigation, considering the emerging data that targeting P selectin with a monoclonal antibody reduces painful crises (48, 49). While quercetins were initially identified based on their PDI-inhibitory activity, flavonoids are known bioactive compounds with pleiotropic activities. We cannot exclude the possibility that some contribution of antithrombotic activity observed was due to off-target effect. However, we previously demonstrated that PDI inhibition in plasma mirrors the pharmacokinetic curve of isoquercetin and isoquercetin-mediated decrease in platelet-dependent thrombin generation is reversed with exogenous PDI (13). Similarly, infusion of recombinant PDI reverses quercetin-mediated inhibition of thrombus formation in vivo (16). In the current study, we demonstrate a direct correlation between changes in plasma PDI inhibitory activity and platelet-dependent thrombin generation, which points to the antithrombotic activity of isoquercetin being predominated by PDI inhibition. More specific PDI inhibitors are currently under development (18, 50). However, the identification of flavonoids as PDI inhibitors was fortuitous, as it enabled us to pursue later-stage human clinical trials entirely within academia. PDI has been identified as a potential therapeutic target for a wide range of pathological conditions. For instance, PDI regulates HIV-1 entry into lymphocytes through disulfide exchange of HIV-associated glycoprotein 120 (5, 51, 52). Pathologic alterations in PDI activity in the endoplasmic reticulum are central to the unfolded protein response observed in aggressive malignancies and neurodegenerative diseases (1, 2, 53–57). Targeting PDI has shown promise in animal models of Parkinson’s disease and amylotrophic lateral sclerosis (50, 58), and small-molecule inhibitors are under investigation as a chemotherapeutics for a range of cancers, including ovarian cancer (59), multiple myeloma (60), and hepatocellular carcinoma (61). We report the first clinical trial to our knowledge to specifically evaluate the clinical efficacy of PDI inhibition in humans. The administration of isoquercetin at 1000 mg daily resulted a significant reduction in markers of coagulation, including D-dimer, thrombin generation, and soluble P selectin accompanied by an absence of proximal VTE. The observation that the administration of isoquercetin successfully achieved all primary and secondary endpoints without a safety signal provides a critical validation step in the development of a novel class of therapeutics. The effectiveness of isoquercetin to prevent VTE in high-risk cancer populations will be evaluated in a planned phase III clinical trial. Study design and participants. CATIQ (Cancer Associated Thrombosis and Isoquercetin) was an investigator-initiated, multicenter, multidose, open-label phase II clinical trial conducted at 10 sites in the United States. Eligible patients were required to have advanced cancer (unresectable or metastatic adenocarcinoma of the pancreas, stage IV colorectal cancer, or stage III/IV non–small cell lung cancer). Patients were enrolled within 4 weeks of initiating first- or second-line chemotherapy. Additional inclusion criteria were as follows: age, ≥18 years; life expectancy, >4 months; Eastern Cooperative Oncology Group (ECOG) performance status, ≤2; absolute neutrophil count, ≥1 × 109/l; platelet count, ≥90 × 109/l; PT and PTT, ≤1.5 times greater than the institutional upper limit of normal; total bilirubin, ≤2.0 mg/dl; aspartate aminotransferase and alanine aminotransferase, ≤2.5 times the institutional upper limit of normal; and creatinine, ≤2.0 mg/dl. Participants were excluded if they were receiving any other anticoagulant therapy, had known brain metastases, had a prior history of VTE within the last 2 years, had a history of hemorrhage requiring transfusion or hospitalization within the last 2 years, had concurrent use of anti-platelet agents (beyond 81 mg aspirin daily), or had evidence of disseminated intravascular coagulation. Patients were enrolled from oncology outpatient clinics between 2014 and 2018. All patients voluntarily gave written informed consent prior to initiation of study procedures. Five patients signed informed consent but did not meet full eligibility criteria and were not registered to participate in the study. Participants were sequentially enrolled into 2 open-label dosing cohorts: cohort A (500 mg isoquercetin) and cohort B (1000 mg isoquercetin). Isoquercetin was manufactured in accordance with Good Manufacturing Practice regulations and supplied in 250 mg capsules by Quercegen Pharmaceuticals. Capsules contained ascorbic acid (62 mg) and niacin (5 mg) to prevent oxidation during storage and were previously shown to not influence isoquercetin pharmacokinetics (13). Isoquercetin was taken orally daily for a total of 56 days. The first 5 patients of each cohort were monitored for evidence of toxicity prior (≥1 grade 3 or higher toxicity possibly related to isoquercetin) prior to the subsequent enrollment of 25 patients into each cohort. Drug diaries and pill counts were performed to ensure compliance. Patients were monitored for development of a venous thromboembolic event throughout the study, including a bilateral lower extremity duplex ultrasound at end of study visit (day 56 + 5). Participants were taken off study if they developed an intercurrent illness that prevented further administration; unacceptable adverse events; poor compliance; participant preference; VTE or condition requiring therapeutic anticoagulation; requirement for prophylactic anticoagulation for >7 consecutive days; grade ≥3 hemorrhage; or otherwise met the ISTH criteria for major hemorrhage (62). Doses were held for grade 2 hemorrhage or platelet count <50 × 109/l. Outcome measurement. Blood was drawn by peripheral venipuncture into 3.2% citrate. Plasma were separated at 2100 g for 20 minutes within 1 hour of specimen collection. A second centrifugation was performed at 2100 g for 20 minutes to generate platelet-free plasma that was stored in aliquots at –80°C until analysis. The primary endpoint of the study was a decrease in plasma D-dimer at the end of study. D-dimer was measured centrally using Asserachrom D-Di ELISA, considered the reference standard assay for D-dimer (Stago) (63). The primary VTE endpoint included any symptomatic proximal or distal DVT, symptomatic PE or fatal PE diagnosed by autopsy, asymptomatic proximal DVT diagnosed by protocol-specified ultrasound at the end of study. All suspected VTE were assessed by an independent adjudication committee that included central radiologic review of images. Criteria for new VTE included any of the following: (a) a new noncompressibility of lower extremity deep venous segments by compression ultrasound (distal lower extremity thrombus qualified for primary VTE endpoint only if symptomatic) and (b) intraluminal defects in 2 or more views on pulmonary angiography or abrupt contrast cut-off of one or more vessels greater than 2.5 mm in diameter on a pulmonary angiogram; a high probability VQ lung scan showing one or more segmental perfusion defects with corresponding normal ventilation (mismatch defect); or abnormal CT showing thrombus in pulmonary vessels (subsegmental or larger). All other venous or arterial events were recorded and analyzed as secondary endpoints. Criteria for major hemorrhage were according to ISTH definition (62). All toxicities were graded according to the National Cancer Institutes Common Terminology Criteria for Adverse Events. Study oversight was performed by an independent Data Safety Monitoring Committee at Dana-Farber/Harvard Cancer Center. PDI inhibition assay in plasma was performed as previously described (13). Human recombinant PDI dual-tagged with FLAG and streptavidin-binding peptide was expressed and isolated from E. coli (BL21) by affinity chromatography with streptavidin-linked agarose resin. Purified recombinant PDI was added at varying concentrations to filtered GSSG-treated plasma with 5 μM DTT and 150 nM di-eosin-GSSG. Enzymatic activity was monitored through the fluorescence of eosin (EGSH). Platelet-dependent thrombin generation was performed according to previously published methodology (13, 32). Briefly, platelet-free plasma were mixed with donor platelet-rich plasma diluted to a platelet concentration of 250,000 platelets per microliter in the presence of 5 mM GPRP and 6 mM CaCl2 and then stimulated with 0.1 U/ml of thrombin. Samples were incubated for 90 minutes at room temperature with rotation, and thrombin levels were measured using cleavage of a fluorescent thrombin-specific substrate (Haemtech SN-20 Boc-L-FPR-ANSNH-C2H5) by excitation at 352 nm and emission as a function of time at 470 nm. Rates of substrate cleavage were used to calculate the concentration of thrombin in each sample. Measurement of soluble P selectin (CD62) was performed centrally using a commercial ELISA (Invitrogen/Thermo Fisher Scientific, BMS219-4), and PT and PTT were measured according to the manufacturer’s standard protocol on a Stago Start 4 instrument (STA-Neoplastine CI Plus 5, 00606; STA-PTT Automate 5, 00595). Statistics. Plasma D-dimer levels decrease approximately 20% following the initiation of therapeutic anticoagulation (37). The median baseline D-dimer measurement in a similarly designed study was 815 μg/l (23). Based on an estimated standard deviation of 0.3 for the ratio of D-dimer at study completion compared with that on day 1, the target enrollment was 26 patients in each arm to achieve 90% power to declare the reduction significant if the true concentration at end of treatment was reduced by 20% (1-sided α = 0.05). The cumulative incidence of VTE or hemorrhage was assessed by competing risk analyses (cmprsk function in R software) in order to account for death as a competing risk (64). Comparisons between baseline and follow-up measurements were performed using 2-tailed, paired t test analyses. Comparisons of baseline demographics were performed using Fisher’s exact test. Statistical correlation between PDI inhibitory activity and D-dimer was assessed using a Pearson’s correlation coefficient. Statistical significance was defined as P < 0.05. Study approval. The protocol was conducted according to Declaration of Helsinki principles and approved by the institutional review boards of the 9 participating medical centers (Dana-Farber/Harvard Cancer Center, Boston, Massachusetts, USA; University of Southern California; VA Medical Center, Washington, DC, USA; Mount Auburn Hospital; White River Junction Veterans Affairs Medical Center; Veterans Affairs Connecticut Healthcare; VA Northern California Health Care System; York Hospital; Boston VA Healthcare System, Massachusetts, USA). Study coordination and monitoring were performed by the Office of Human Research Studies and Office of Data Quality at Dana-Farber/Harvard Cancer Center as well as the Cancer Clinical Trials Office at Beth Israel Deaconess Medical Center. All patients voluntarily gave written informed consent prior to initiation of study procedures. JIZ, HAL, KAB, MP, DN, BF, and RF conceived the study. JIZ, MP, and DN curated the data. JIZ, JDS, KAB, MP, DN, BF, and RF provided formal analysis. JIZ, BF, and RF acquired funding. JIZ, BLS, JDS, HAL, AA, TC, KAB, NK, EW, TW, MM, and MH provided study investigation. JIZ, MP, and DN provided study methodology. JIZ, DN, RF, and MH supervised the study. JIZ, BF, and RF wrote the original draft. All authors reviewed and edited the manuscript. We thank Thomas Lines for informative discussions on flavonoid biology and perseverance in isoquercetin manufacturing and support. This work was supported by Quercegen Pharmaceuticals, the NHLBI (U54HL112302, R35HL135775, and T32HL007917), and the NHLBI Consortium Linking Oncology and Thrombosis (U01HL143365). See Supplemental Acknowledgments for CATIQ details. Conflict of interest: JIZ serves as a consultant for Parexel and served on advisory boards for Bayer, Seattle Genetics, and Incyte. TW receives research support and serves on advisory boards for Janssen and Pfizer. RF is a consultant for PlateletDiagnostics. JDS is an employee of Rubius Therapeutics. DN serves as a trustee with stock ownership in Madrigal Pharmaceuticals and receives research funding from Pharmacyclics. HAL reports spousal consulting income from Alexion. MH discloses equity in Champions Oncology and research support and/or honoraria from Celgene, Pfizer, Bioline, Asana, Erytech, Bicycle, Berg, Roche, EMD, Oncomatryx, MedImmune, Bayer, Novartis, Targovax, MSD, and Bioncotech. Reference information: JCI Insight. 2019;4(4):e125851. https://doi.org/10.1172/jci.insight.125851. Townsend DM, et al. Nitrosative stress-induced s-glutathionylation of protein disulfide isomerase leads to activation of the unfolded protein response. Cancer Res. 2009;69(19):7626–7634. Xu S, Sankar S, Neamati N. Protein disulfide isomerase: a promising target for cancer therapy. Drug Discov Today. 2014;19(3):222–240. Uehara T, et al. S-nitrosylated protein-disulphide isomerase links protein misfolding to neurodegeneration. Nature. 2006;441(7092):513–517. Gonzalez-Perez P, et al. Identification of rare protein disulfide isomerase gene variants in amyotrophic lateral sclerosis patients. Gene. 2015;566(2):158–165. Bi S, Hong PW, Lee B, Baum LG. Galectin-9 binding to cell surface protein disulfide isomerase regulates the redox environment to enhance T-cell migration and HIV entry. Proc Natl Acad Sci USA. 2011;108(26):10650–10655. Gallina A, et al. Inhibitors of protein-disulfide isomerase prevent cleavage of disulfide bonds in receptor-bound glycoprotein 120 and prevent HIV-1 entry. J Biol Chem. 2002;277(52):50579–50588. Flaumenhaft R, Furie B. Vascular thiol isomerases. Blood. 2016;128(7):893–901. Cho J, Furie BC, Coughlin SR, Furie B. A critical role for extracellular protein disulfide isomerase during thrombus formation in mice. J Clin Invest. 2008;118(3):1123–1131. Essex DW, Li M, Miller A, Feinman RD. Protein disulfide isomerase and sulfhydryl-dependent pathways in platelet activation. Biochemistry. 2001;40(20):6070–6075. Reinhardt C, et al. Protein disulfide isomerase acts as an injury response signal that enhances fibrin generation via tissue factor activation. J Clin Invest. 2008;118(3):1110–1122. Cho J, et al. Protein disulfide isomerase capture during thrombus formation in vivo depends on the presence of β3 integrins. Blood. 2012;120(3):647–655. Zucker M, Seligsohn U, Yeheskel A, Mor-Cohen R. An allosteric disulfide bond is involved in enhanced activation of factor XI by protein disulfide isomerase. J Thromb Haemost. 2016;14(11):2202–2211. Stopa JD, Neuberg D, Puligandla M, Furie B, Flaumenhaft R, Zwicker JI. Protein disulfide isomerase inhibition blocks thrombin generation in humans by interfering with platelet factor V activation. JCI Insight. 2017;2(1):e89373. Bowley SR, Fang C, Merrill-Skoloff G, Furie BC, Furie B. Protein disulfide isomerase secretion following vascular injury initiates a regulatory pathway for thrombus formation. Nat Commun. 2017;8:14151. Jasuja R, Furie B, Furie BC. Endothelium-derived but not platelet-derived protein disulfide isomerase is required for thrombus formation in vivo. Blood. 2010;116(22):4665–4674. Kim K, et al. Platelet protein disulfide isomerase is required for thrombus formation but not for hemostasis in mice. Blood. 2013;122(6):1052–1061. Bekendam RH, et al. A substrate-driven allosteric switch that enhances PDI catalytic activity. Nat Commun. 2016;7:12579. Hertog MG, Feskens EJ, Hollman PC, Katan MB, Kromhout D. Dietary antioxidant flavonoids and risk of coronary heart disease: the Zutphen Elderly Study. Lancet. 1993;342(8878):1007–1011. Keli SO, Hertog MG, Feskens EJ, Kromhout D. Dietary flavonoids, antioxidant vitamins, and incidence of stroke: the Zutphen study. Arch Intern Med. 1996;156(6):637–642. Khorana AA, Francis CW, Culakova E, Kuderer NM, Lyman GH. Thromboembolism is a leading cause of death in cancer patients receiving outpatient chemotherapy. J Thromb Haemost. 2007;5(3):632–634. Timp JF, Braekkan SK, Versteeg HH, Cannegieter SC. Epidemiology of cancer-associated venous thrombosis. Blood. 2013;122(10):1712–1723. Zwicker JI, et al. Prediction and prevention of thromboembolic events with enoxaparin in cancer patients with elevated tissue factor-bearing microparticles: a randomized-controlled phase II trial (the Microtec study). Br J Haematol. 2013;160(4):530–537. Maraveyas A, et al. Gemcitabine versus gemcitabine plus dalteparin thromboprophylaxis in pancreatic cancer. Eur J Cancer. 2012;48(9):1283–1292. Khorana AA, et al. Dalteparin thromboprophylaxis in cancer patients at high risk for venous thromboembolism: A randomized trial. Thromb Res. 2017;151:89–95. Kamphuisen PW, Beyer-Westendorf, J. Bleeding complications during anticoagulant treatment in patients with cancer. Thromb Res. (2014); 133(suppl 2):S49-S55. Carrier M, et al. Apixaban to Prevent Venous Thromboembolism in Patients with Cancer [published online ahead of print (December 4, 2018)]. N Engl J Med.https://www.nejm.org/doi/full/10.1056/NEJMoa1814468?url_ver = Z39.88-2003&rfr_id = ori:rid:crossref.org&rfr_dat = cr_pub%3dpubmed. Bates SM, et al. Diagnosis of DVT: Antithrombotic Therapy and Prevention of Thrombosis, 9th ed: American College of Chest Physicians Evidence-Based Clinical Practice Guidelines. Chest. 2012;141(2 Suppl):e351S–e418S. Weitz JI, Fredenburgh JC, Eikelboom JW. A test in context: D-dimer. J Am Coll Cardiol. 2017;70(19):2411–2420. Pabinger I, et al. A clinical prediction model for cancer-associated venous thromboembolism: a development and validation study in two independent prospective cohorts. Lancet Haematol. 2018;5(7):e289–e298. Ay C, et al. Prediction of venous thromboembolism in cancer patients. Blood. 2010;116(24):5377–5382. Jurk K, Lahav J, VAN Aken H, Brodde MF, Nofer JR, Kehrel BE. Extracellular protein disulfide isomerase regulates feedback activation of platelet thrombin generation via modulation of coagulation factor binding. J Thromb Haemost. 2011;9(11):2278–2290. Fernandes LFB, Fregnani JHTG, Strunz CMC, de Andrade Ramos Nogueira A, Longatto-Filho A. Role of P-selectin in thromboembolic events in patients with cancer. Mol Clin Oncol. 2018;8(1):188–196. Ay C, et al. High plasma levels of soluble P-selectin are predictive of venous thromboembolism in cancer patients: results from the Vienna Cancer and Thrombosis Study (CATS). Blood. 2008;112(7):2703–2708. Jara-Palomares L, et al. D-dimer and high-sensitivity C-reactive protein levels to predict venous thromboembolism recurrence after discontinuation of anticoagulation for cancer-associated thrombosis. Br J Cancer. 2018;119(8):915–921. Scheres LJJ, et al. Measurement of coagulation factors during rivaroxaban and apixaban treatment: Results from two crossover trials. Res Pract Thromb Haemost. 2018;2(4):689–695. Kuruvilla J, Wells PS, Morrow B, MacKinnon K, Keeney M, Kovacs MJ. Prospective assessment of the natural history of positive D-dimer results in persons with acute venous thromboembolism (DVT or PE). Thromb Haemost. 2003;89(2):284–287. Cella CA, et al. Preventing venous thromboembolism in ambulatory cancer patients: the ONKOTEV study. Oncologist. 2017;22(5):601–608. Quercegen, Documentation supporting the generally recognized as safe (GRAS) status of quercetin for use in food. FDA GRAS Notice: 000341. 2010. https://www.accessdata.fda.gov/scripts/fdcc/index.cfm?set=grasnotices&id=341 Accessed February 5, 2019. Kamath S, Blann AD, Chin BS, Lip GY. A prospective randomized trial of aspirin-clopidogrel combination therapy and dose-adjusted warfarin on indices of thrombogenesis and platelet activation in atrial fibrillation. J Am Coll Cardiol. 2002;40(3):484–490. Kamath S, Blann AD, Caine GJ, Gurney D, Chin BS, Lip GY. Platelet P-selectin levels in relation to plasma soluble P-selectin and beta-thromboglobulin levels in atrial fibrillation. Stroke. 2002;33(5):1237–1242. Zemer-Wassercug N, et al. The effect of dabigatran and rivaroxaban on platelet reactivity and inflammatory markers. J Thromb Thrombolysis. 2015;40(3):340–346. Falati S, et al. Accumulation of tissue factor into developing thrombi in vivo is dependent upon microparticle P-selectin glycoprotein ligand 1 and platelet P-selectin. J Exp Med. 2003;197(11):1585–1598. Panicker SR, Mehta-D’souza P, Zhang N, Klopocki AG, Shao B, McEver RP. Circulating soluble P-selectin must dimerize to promote inflammation and coagulation in mice. Blood. 2017;130(2):181–191. van Es N, et al. Predicting the risk of recurrent venous thromboembolism in patients with cancer: A prospective cohort study. Thromb Res. 2018;163:41–46. Reitter EM, et al. Longitudinal analysis of hemostasis biomarkers in cancer patients during antitumor treatment. J Thromb Haemost. 2016;14(2):294–305. Thomas GM, Panicot-Dubois L, Lacroix R, Dignat-George F, Lombardo D, Dubois C. Cancer cell-derived microparticles bearing P-selectin glycoprotein ligand 1 accelerate thrombus formation in vivo. J Exp Med. 2009;206(9):1913–1927. Ataga KI, et al. Crizanlizumab for the prevention of pain crises in sickle cell disease. N Engl J Med. 2017;376(5):429–439. Prado GN, Romero JR, Rivera A. Endothelin-1 receptor antagonists regulate cell surface-associated protein disulfide isomerase in sickle cell disease. FASEB J. 2013;27(11):4619–4629. Jeon GS, et al. Potential effect of S-nitrosylated protein disulfide isomerase on mutant SOD1 aggregation and neuronal cell death in amyotrophic lateral sclerosis. Mol Neurobiol. 2014;49(2):796–807. Reiser K, et al. Thioredoxin-1 and protein disulfide isomerase catalyze the reduction of similar disulfides in HIV gp120. Int J Biochem Cell Biol. 2012;44(3):556–562. Cerutti N, Killick M, Jugnarain V, Papathanasopoulos M, Capovilla A. Disulfide reduction in CD4 domain 1 or 2 is essential for interaction with HIV glycoprotein 120 (gp120), which impairs thioredoxin-driven CD4 dimerization. J Biol Chem. 2014;289(15):10455–10465. Nakato R, et al. Regulation of the unfolded protein response via S-nitrosylation of sensors of endoplasmic reticulum stress. Sci Rep. 2015;5:14812. Jaronen M, et al. Protein disulfide isomerase in ALS mouse glia links protein misfolding with NADPH oxidase-catalyzed superoxide production. Hum Mol Genet. 2013;22(4):646–655. Lee JH, et al. Induction of the unfolded protein response and cell death pathway in Alzheimer’s disease, but not in aged Tg2576 mice. Exp Mol Med. 2010;42(5):386–394. Krysov S, et al. Stimulation of surface IgM of chronic lymphocytic leukemia cells induces an unfolded protein response dependent on BTK and SYK. Blood. 2014;124(20):3101–3109. Lehtonen Š, et al. Inhibition of excessive oxidative protein folding is protective in MPP(+) toxicity-induced Parkinson’s disease models. Antioxid Redox Signal. 2016;25(8):485–497. Xu S, et al. Discovery of an orally active small-molecule irreversible inhibitor of protein disulfide isomerase for ovarian cancer treatment. Proc Natl Acad Sci USA. 2012;109(40):16348–16353. Robinson RM, et al., Inhibitors of the protein disulfide isomerase family for the treatment of multiple myeloma [published online ahead of print (October 12, 2018)]. Leukemia. https://www.nature.com/articles/s41375-018-0263-1. Won JK, et al. Protein disulfide isomerase inhibition synergistically enhances the efficacy of sorafenib for hepatocellular carcinoma. Hepatology. 2017;66(3):855–868. Schulman S, Kearon C, Subcommittee on Control of Anticoagulation of the Scientific Standardization Committee of the International Society on Thrombosis Haemostasis . Definition of major bleeding in clinical investigations of antihemostatic medicinal products in non-surgical patients. J Thromb Haemost. 2005;3(4):692–694. Meyer G, et al. Diagnostic value of two rapid and individual D-dimer assays in patients with clinically suspected pulmonary embolism: comparison with microplate enzyme-linked immunosorbent assay. Blood Coagul Fibrinolysis. 1998;9(7):603–608. Campigotto M, et al. Biased estimation of thrombosis rates in cancer studies using the method of Kaplan and Meier. J Thromb Haemost. 2012;10(7):1449–1451.